A small stretch of Pennypack Park along State Road may soon be home to an electronic billboard. A City Council committee voted last Tuesday to rezone the park, carving out enough space for the sign along I-95. The final vote will occur Thursday, but it is almost certain that it will pass. The package of two bills, sponsored by Councilman Bobby Henon, rezone the land so that the billboard can be placed there, and then create exceptions to regulations regarding proximity to other billboards (there’s one across the street). While it is a relatively small part of the park (see below) and one that is hardly used, some residents are pretty upset over the proposed bill. Michael McGettigan, who owns Trophy Bikes, said that “billboards are the walking dead,” meaning that they are bordering on irrelevancy since most people get their media from mobile devices and computers. The billboard will also be distracting, figures McGettigan. He flashed a bike light in the eyes of the Council to demonstrate his point during last week’s hearing. "Real estate agents say homes caught in the glow could lose value." "Your room will be red, then it will be blue, then it will be yellow, whatever the color of the moment is," Tracy said. "That is really an issue of quality of sleep and quality of life." "They're not safe because the whole purpose of these things is to distract people,"
"Quick, quick, quick - get your zoning up to date," she advised other towns. A very important story coming out of Texas. Round Two for Springfield goes to............SPRINGFIELD! Whether or not the Zoning Board has jurisdiction about site specific relief had the decision gone BIG's way. After six days, the Judge affirmed the Zoning Board's decision. BIG can and most likely will appeal this decision to the Commonwealth Court, but for now, a hearty congratulations to Springfield Township Commissioners, Jim Byrne, Solicitor and residents!! Paul Seligson, a Newtown Square resident, writes a letter to the editor of the Marple Newtown Patch on the billboard issue in town. 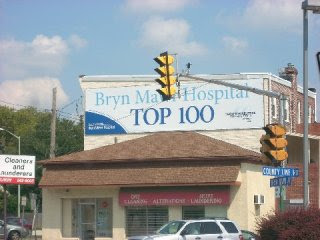 Proposed location of billboard: West Chester Pike/Rt. 3, between Mill Hollow Lane and cement bridge leading to Edgmont Township opposite Subaru dealership. When my wife and I first heard of a Digital Outdoor Monument Sign being considered for the township property at the very front of our homestead, we thought for the sake of Newtown Township and to avoid three larger placed 68-feet-high billboards over air rights of existing Newtown merchants, we could live with this and be a team player. Having driven down to south Rt. 202 in Westtown Township to inspect a sign of the same size, (photo below) please notice the sign size vs. me standing at the left pillar. I believe the sign size for the scale of this piece of land is just too large. The sign would sit atop an 8 foot berm and begin 5 feet above that for a total of starting at 14 feet high. In total, the top of the sign would be approximately 35 feet up from ground level. Going into the woods, with all the pillers and façade treatment, it would probably reach a distance of 50 feet. This is a picture of Paul in front of the newly constructed "gateway" digital billboard in Westtown. Can you find Paul in the Picture? For the first time in decades, drivers heading east at the Five Points intersection in Bryn Mawr are gazing at a blank wall. AdSmart Outdoor Advertising Inc. in recent days removed a large vinyl-wrapped billboard from the upper wall of a building on Old Railroad Avenue, leaving only a wooden frame. The 8 ½-by-34-foot sign has been the subject of a dispute between the advertising company and Lower Merion Township since 2009. On Feb. 1, a Montgomery County Common Pleas Court judge affirmed a 2010 Lower Merion Zoning Hearing Board decision that the off-premises advertising is prohibited under the property’s C-2 commercial zoning. Join the fight against Billboards!